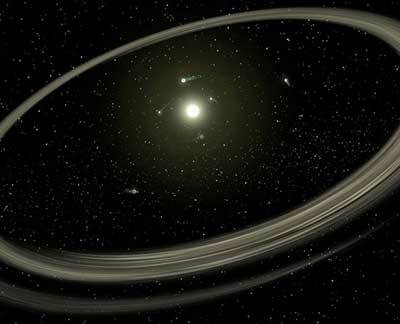 Brand new planetary systems take much longer to form than previously thought. Early Solar system Was a Mess. Brand new planetary systems take much longer to form than previously thought, according to new data gathered by the Spitzer space telescope - and it's a nasty, chaotic period. Researchers pointed Spitzer at 71 dusty disks which are new planets in the making, and found that many seem choked with dust, hundreds of millions of years after the host star formed. The only way this could be possible is if mountain range-sized planetesimals were continuously crashing into each other on the long hard road to full sized planethood. The European Space Agency's Mars Express took this image of the rim of impact crater Huygens, which is 450 km (280 miles) across. By counting craters in the area, researchers have determined that Huygens was blasted out approximately 4 billion years ago, early on in Mars' history when the planet was being heavily bombarded like the rest of the planets in the Solar System. The rim seems to show a tributary system that could have been water runoff in the ancient Martian past.